In particular, two-and-a-half million years ago the Earth was changing dramatically. The Pliocene, which was a hot and balmy epoch, was ending and the Pleistocene, an era of repeated glaciation known as the Ice Age, was beginning. Natural variations in Earth's orbit and wobble likely accounted for the change in climate, but the simultaneous event of a supernova could provide insight on the diversification of life during this epoch. 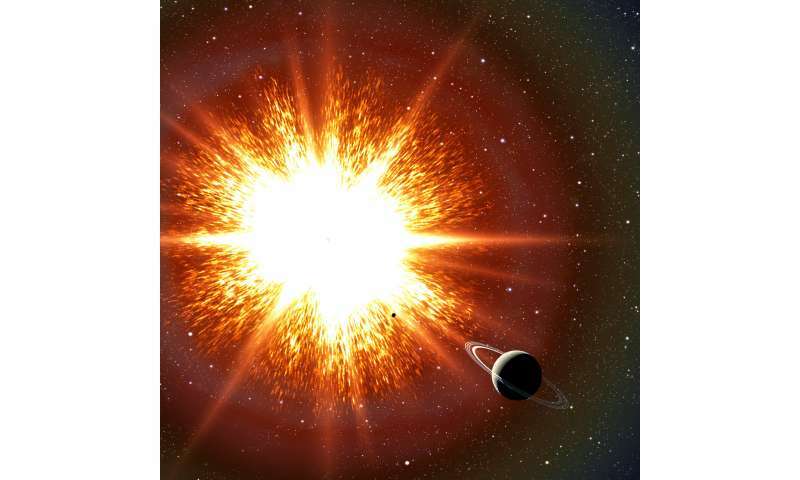 Supernovae can sterilize any nearby inhabited planets that happen to be in the path of their harmful ionizing radiation. Could nearby supernovae wreak havoc on the existing biology of our planet? One researcher wanted to find out. Dr. Brian Thomas, an astrophysicist at Washburn University in Kansas, USA, modeled the biological impacts at the Earth's surface, based on geologic evidence of nearby supernovae 2.5 million and 8 million years ago. In his latest paper, Thomas investigated cosmic rays from the supernovae as they propagated through our atmosphere to the surface, to understand their effect on living organisms. Looking at the fossil record during the Pliocene–Pleistocene boundary (2.5 million years ago), we see a dramatic change in the fossil record and in land cover globally. Thomas tells Astrobiology Magazinethat "there were changes, especially in Africa, which went from being more forested to more grassland." During this time the geologic record shows an elevated global concentration of iron-60 (60Fe), which is a radioactive isotope produced during a supernova. "We are interested in how exploding stars affect life on Earth, and it turns out a few million years ago there were changesin the things that were living at the time," says Thomas. "It might have been connected to this supernova." 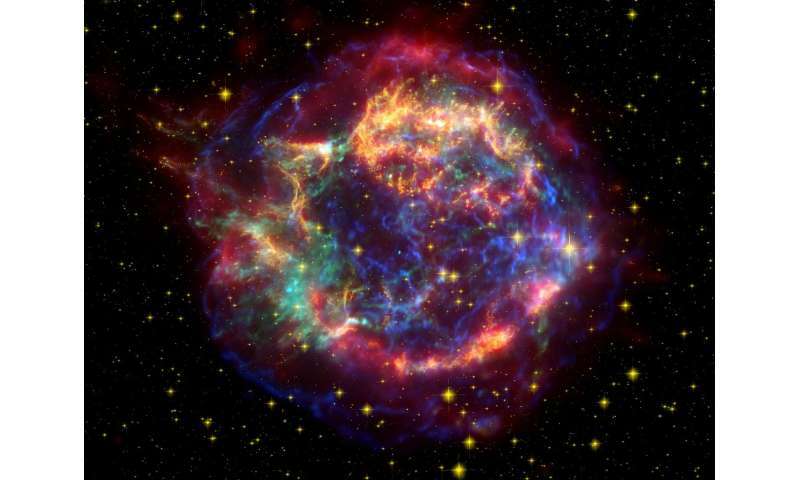 How would a nearby supernova affect life on Earth? Thomas laments that supernovae often are exemplified as "supernova goes off and everything dies", but that is not quite the case. The answer lies in the atmosphere. Beyond sunscreen, the ozone layer protects all biology from harmful, genetically altering ultraviolet (UV) radiation. Thomas used global climate models, recent atmospheric chemistry models and radiative transfer (the propagation of radiation through the layers of the atmosphere) to better understand how the flux of cosmic rays from supernovae would alter Earth's atmosphere, specifically the ozone layer. One thing to note is that cosmic rays from supernovae would not blast everything in their paths all at once. The intergalactic medium acts as a kind of sieve, slowing down the arrival of cosmic rays and "radioactive iron rain" (60Fe) over hundreds of thousands of years, Thomastells Astrobiology Magazine. Higher energetic particles will reach Earth first and interact with our atmosphere differently than lower energy particles arriving later. 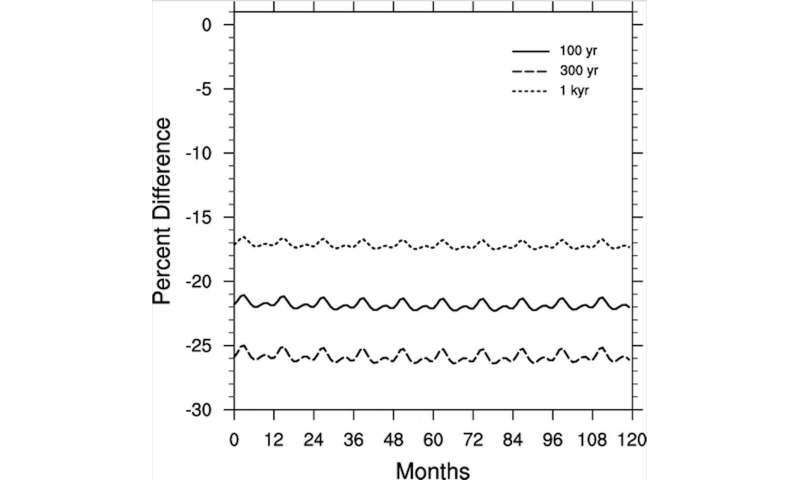 Thomas's study modeled the depletion in ozone 100, 300, and 1,000 years after the initial particles from a supernovabegan penetrating our atmosphere. Interestingly, depletion peaked (at roughly 26 percent) for the 300-year case, beating out the 100-year case. A decrease in ozone could be a concern for life on the surface. "This work is an important step towards understanding the impact of nearby supernovae on our biosphere," says Dr. Dimitra Atri, a computational physicist at the Blue Marble Space Institute of Science in Seattle, USA. Thomas examined several possible biologically-damaging effects (erythema, skin cancer, cataracts, marine phytoplankton photosynthesis inhibition and plant damage) at different latitudes as a result of increased UV radiation resulting from a depleted ozone layer. They showed heightened damage across the board, generally increasing with latitude, which makes sense given the changes we see in the fossil record. However, the effects aren't equally detrimental to all organisms. Plankton, the primary producers of oxygen, seemed to be minimally affected. The results also suggested a small increase in the risk of sunburn and skin cancer among humans. So, do nearby supernovae result in mass extinctions? It depends, says Thomas. "There is a subtler shift; instead of a 'wipe-out everything', some [organisms] are better off and some are worse off." For example some plants showed increase yield, like soybean and wheat, while other plants showed reduced productivity. "It fits," Thomas states, referring to the change in species in the fossil record. One more example of how celestial mechanics helped influence the evolution of life on earth.